Posted: Thursday, January 19, 2017. 4:49 pm CST. Posted: Thursday, January 19, 2017. 4:47 p.m. CST. By BBN Staff:Yesterday, Minister of Transport Edmond Castro visited the bus terminal in the village of Independence in the Stann Creek District to get a first-hand assessment of how the terminal is operating and serving the needs of the bus-operators and commuters in the area. Castro met with Terminal Manager Mateo Salam; assistants, Clive Westby and Sherna Logan; and other personnel, and discussed ways of improving the terminal. Those include, better communication (Telephone and Internet), bathrooms, entrance and exit gates and booths, as well as culverts to improve drainage in and around the terminal compound. Castro also spoke with commuters and vendors. He thanked the personnel at the terminal for their dedicated service and encouraged them to continue doing their best to enhance the experience of commuting Belizeans and visitors to our country who utilize the terminal. The first such facility in any village countrywide, the bus terminal was constructed through the efforts of former Stann Creek West Area Representative, Melvin Minister, who also served as Minister of Transport. 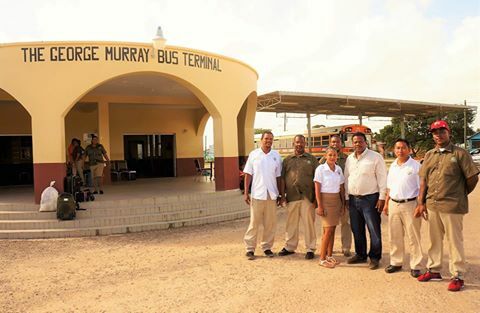 The bus terminal was inaugurated in December 2013 and named after a former chairman of Independence Village, the late George Murray.